Heya. So, I was looking at a plate, and I said: wow, this thing looks realy empty. That was when I got an idea. My idea was making something that would make it harder to cells move around. So, ive created the SoilMaker. Note that its actualy very simple. Its more basic than a basic swimmer: it has 2 modes! In this ecosystem, it have the SoilMaker, an "basic Swimmer" that I created and a more complex one that Ive got from the forums. Note that I didnt created the bigger, red and black one.It was created by 121Daredevil. It have 5 SoilMakers in the picture/plate. I didnt added a predator to it because Im afraid that he might kill one of the SoilMakers. Ive still need to fix that, but I couldnt do it. If anyone has any idea, tell me ok? Last edited by Eu Sou A Fazenda on Mon Oct 02, 2017 12:05 pm, edited 3 times in total. Isn't that serpent looks like the substrate that i made from an ecosystem? Isn't that serpent looks like the substrate that i made from an ecosystem? Or is it just me? 121daredevil wrote: Isn't that serpent looks like the substrate that i made from an ecosystem? Or is it just me? I think yes, I got it from a post. Im going to edit it to give you credits, sorry! I don't think you need to but however you like, since you aren't claiming you created the serpent but the other organism. About it though, like it. You should give it a Keratinocyte constantly attached to it because a clever organism could clean the plate by targeting the Photocytes. Making it immune would make it stronger. Okay guys, so ive did some experiments, and Ive got a improvement to the SoilMaker and 2 new creations. Lets start with the SoilMaker. 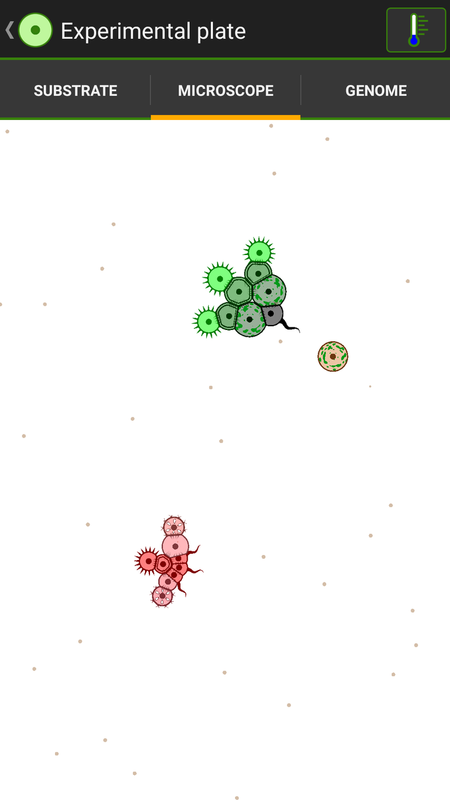 Ive upgraded it by, when it divides, it creates a copy of itself and another Photocyte. The photocyte then grow a little and splint into 2 Keratinocytes.This means that he actualy produces the double the soil. Now, lets go to the new genomes. to his 3 Flagellocytes comsuming too much energy. When one of its Senseocytes detects any cell, he moves faster so that he dosnt loose it. can enter between its censors and Devoracyte is bad, making his speed even lower when caring dirt. The lack of many Devoracyte makes it even harder to eat its prew. Now, lets look at its strongest brother, DirtLover. its a dumb creature, whitch is great here, so he wont detect rocks as food. Having only one Flagellocyte also helps him, as he dont use a lot of energy per second. He has 2 Photocytes, so even when completely stopped by the soil he still can live well. Even there he still can make a important part of its life: Reproduction. He reproducts by the tail, so all DirtHaters that are born will walk away from the place where he was stuck. And he has a LOT of childres. Another thing that defines its survivability is the weapons: Having 3 Devoracitys realy helps he corner his oponents. And, even when this donst work, he still can kill the competition. There is a bug (I think its a bug, I dont know) that if a cell gets smashed on the corner of the map, it dissapears (yes I double-checked, the option "Kill Cells at edge" wasnt on). This means that he can kill pushing the soil into its oponents. And he realy wont misss that food, he can live withouth food thanks to the Photocytes. What im realy liking here is the fact that intelligent creatures are sligtly worse than inteligents here. Not only they will detect the wrong cell, but the bigger you are, the harder it is to walk around. And brains take space. and the dirt (At least till where I know). Basic swimmers seem to be very good around here. When a cell dies, it leaves some food left. Basic Swimmers are very good at getting those, as they are small (being able to pass trought cells) and eat exactly that. Ill keep researching more cool things that can be done in a terrain like this. This is all for now. I'm very proud of your creations! Although your welcome to use my ecosystem when ever you want. Oh and your creation is very Impressive. I might send it to my collection. Congratulations by the way. 121daredevil wrote: My serpent just curls up in my ecosystem. Is that where your inspiration flows up? Yea, after some time it also curled in mine ecosystem. Anyways, here is another creature I made. This time, it isnt related to the SoilMaker, but it has a similar concept. Its just a normal basic swimmer, BUT when it reproduces it leaves a Keratinocyte. It can be used to slow down predators or confuse them (after all, Senseocytes still detect they as cells). Just like some sea creatures! It looks like today isnt the day for smart swimmers.